Visiting Isle of Mull, lochside self catering cottage. Otters and Eagles. Clachan Cottage is a ten minute stroll from the centre of Dervaig, in the North of Mull. The village has its own Post Office and well stocked shop where you’ll find just about everything you need. It is also home to the Bellachroy Hotel where meals and drinks are served all year around. Dervaig has its own Artisan bakery too. Clachan Cottage is a 20 minute drive from Tobermory, where you’ll be spoilt for choice on restaurants, gift shops and cafes. There is also a Co-Op store. A ten minute drive from the cottage takes you to Amberllin, a restaurant serving local produce. A few minutes further on is Calgary Bay with the Boat ice cream shack. This is a must visit. A five minute drive takes you to the Old Byre Heritage Centre. There is a sweet little tea room there too. One of my favourites is the Glass Barn Cafe, at Glengorm. Between Dervaig and Tobermory and home of Mull Cheeses. Duart Castle is a lovely visit with a opportunity for cream teas and lunches. Note that if crossing from Oban, you will sail past the castle, so keep your eyes peeled. There are many trips to Staffa, Fingal’s Cave and Iona. If you’re staying at Clachan Cottage, you just need to look out the window. For guests with specific wish lists, please email me and I will help you as best I can to improve your chances. Mull truly is a wildlife paradise and it’s highly unlikely to visit and not see eagles, otters and deer. 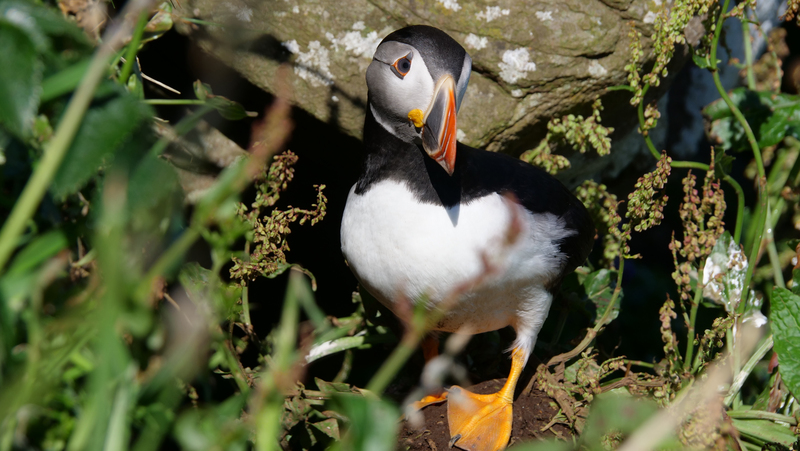 Dolphins and whale’s are also possible and puffins on the Staffa Tours trips. If you’d like a guided approach to watching eagles, get in touch with Mull Eagle Watch.